Syracuse went on a late run to pull out a narrow win over Gonzaga and advance to the Elite Eight. 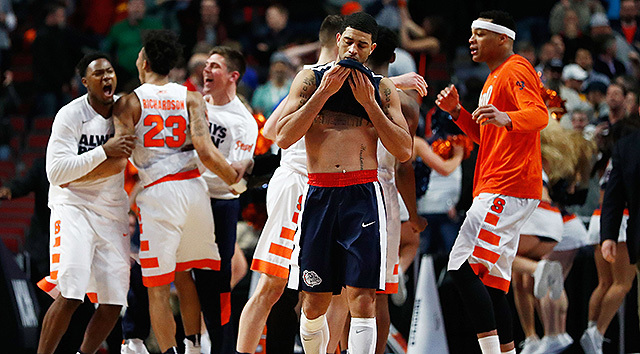 Syracuse’s trademark 2–3 zone caused Gonzaga some trouble, but it was its full-court press that led the Orange to a stunning 63–60 win over Gonzaga on Friday night in Chicago. Led by its defensive pressure and effectiveness on the offensive glass, Syracuse finished the game on an 9–1 run to secure its third Elite Eight appearance in the last five seasons while denying Gonzaga of back-to-back trips to the Elite Eight. The Bulldogs held a 59–54 lead with just 3:10 remaining, but the Orange’s smothering defensive pressure, a big putback from Michael Gbinije with 22 seconds remaining and a crucial blocked shot from freshman Tyler Lydon with 1.6 seconds remaining propelled the Orange to the Elite Eight in a fraught season. Several pundits deemed Syracuse unworthy of a tournament spot, but coach Jim Boeheim (who was suspended for the first nine games) is now one win away from what would be his fifth career Final Four. Gbinije finished with 20 points while junior Tyler Roberson mined the offensive and defensive glass to finish with 12 rebounds and lead Syracuse to its astounding win. Kyle Wiltjer led the Bulldogs in scoring with 23 points while sophomore Domantas Sabonis recorded his 23rd double-double of the season with 19 points and 17 rebounds. Syracuse may have finished 10th in the ACC this season, but it’s still alive. Its ability to remain so was emphasized on Friday night. The Orange looked like the weaker side for about 36 minutes against a skilled Gonzaga side, but they suffocated the Zags in the late minutes and hammered the offensive glass to a secure an unlikely win. Syracuse had very little going for it offensively, finishing a lukewarm 36% from the field and 33% from three-point range, yet was able to hold the Bulldogs’ stars in check in the late minutes. Scoring against Virginia’s vaunted defense will be no easy measure on Sunday afternoon, but the Orange may have the defense to keep the game low-scoring and close into the late stages. Syracuse battles No. 1 Virginia on Sunday in Chicago. The two teams met on January 24th in Charlottesville with the Cavaliers prevailing, 73–65.